Last Christmas I posted about orevnitza, the Serbian bread we eat at Christmas…What I didn’t mention was that there’s a back story to orevnitza from my childhood. A story about foraging (or stealing), mortification, and class difference. I wrote it down about ten years ago and never published it. When I finally went public with it at a reading during October’s Litquake event, I was gratified that people seemed to enjoy it, and vowed to post it here. It was mid November in 1975, I was 11 years old, and my parents and I were going to get the walnuts for the orevnitza, which is our Serbian family’s Christmas bread that my mom made every year. We set out in our 1974 brown four-door Toyota Corolla from Southeast Santa Rosa where we lived, toward Glen Ellen on Highway 12. It was the kind of day that causes harvest time visitors to sell everything, quit their jobs and move to Sonoma County. It was warm. The leaves on the oak trees glistened in the sun. The vineyards were showing their fall colors. The light was muted and dreamy. A perfect fall day. Then the weekend would come and my mom would make the dough and set it to rise. After it had risen for a few hours, my two sisters and I would be called in to punch the dough down. We loved this for some reason. It was kind of like being a member of a firing squad because we’d all pound our fists into the dough at the exact same moment, and never know whose fist deflated it. Once my older sisters moved out, I got to do it by myself, but only for a while. My mom found a short cut recipe that she said was just as good, but it really wasn’t. Even as a kid, I could taste the difference in the new recipe, which only required one rise, and was not punched down. After another rise, the dough was rolled out, the filling spread on, and then it was rolled up and arranged into a snail shape where it sat again to rise for a couple of hours under a kitchen towel. Finally it was baked, and would emerge from the oven golden brown, crusty, and aromatic. My mom always made two…one to freeze or to take somewhere as a hostess gift and one for us to eat. We ate thick slices at all times of the day and night all through the holidays. After a couple of days it would get a little stale and then we’d toast it and eat it with lots of butter slathered on top and melted. And that’s still my favorite way to eat it. My parents were quirky about the way we spent money, which was why we were headed out to the country to pick up walnuts off the ground, instead of going to the grocery store like other people. Though I don’t remember wanting many things that I didn’t get as a kid (except for designer jeans, a canopy bed, disco lessons, and the airplane for stewardess Barbie) my parents often behaved as if we were destitute. They both grew up during the depression and had an attitude about money characteristic of people growing up during that time…or so I’ve heard. They were the kind of people who clipped coupons and read the sales ads, and then would spend all Saturday grocery shopping, hitting several grocery stores all over town to make sure they got the absolute best price on everything. If a store was out of an advertised item, they’d get a rain check, and you can be sure they’d go get the item later in the week. My parents prided themselves on their ability to save money …or better yet, to get something for nothing. It was their recreation. Walnut gathering was not an activity I would have volunteered for, as I was the type of kid who much preferred to stick my head in a book than to interact with the family. I had reached the age where I often stayed home alone during the Saturday grocery shopping marathons. I was probably only along that day because my parents felt we needed a family outing, and convinced me to go. So, I leafed through a book, and daydreamed in the backseat as we pulled into a little road off the highway that led to someone’s farmhouse, set in the midst of a walnut grove. My parents pulled over, and I sat in the car, most likely in a pre-adolescent spoiled brat gloom. I couldn’t understand why they were taking walnuts off of someone else’s property. They assured me it was ok, because they weren’t going to take them off the trees, but just off the ground. The walnuts would just lie there and rot otherwise. My parents eagerly leapt out of the car, paper bags clutched tightly in their hands. Their bent, scurrying figures retreated farther into the walnut grove, and I sat, enjoying my book, until a shiny new dark blue Mercedes came up the road in a tear, raising a cloud of dust. The Mercedes stopped right behind our Toyota. A well dressed thirty-something dark haired woman flung open her car door, jumped out, in full fury, and screamed at my parents: “What do you think you are doing? Those are my father’s nuts!” Time stopped. I ducked down in the back seat to avoid being seen; She waved her arms. She was having trouble catching her breath. The dust from her sudden stop swirled around her combining with her nearly visible anger to create a strange vortex. I’d never experienced anything like it. I remember thinking she looked like a cartoon character. Throughout the scene, I kept poking my head up over the seat an inch to see what was going to happen. My parents froze for a moment, and even looked a bit sheepish. This didn’t last long. They quickly regained their composure and attitude. They stood up straight, looked at each other, looked at her, and laughed. They laughed at her anger and at her double entendre. I think they even repeated: “your father’s nuts?” breaking down into giggles again. From the backseat, I could hear insults being flung back and forth, but I was much too embarrassed to come up for air. Things died down and my parents got into the car, with the nuts they had already taken, but no more, and we drove off. As we drove home, my parents kept up their bravado and hid their mortification with a dissertation on class, although they wouldn’t have described it that way: “Who does she think she is in that shiny new car?” “What are a few walnuts to her?” “How selfish and petty.” Of course they told the story to everyone they knew. Someone finally saw fit to point out that walnuts are routinely harvested off the ground, not off of the trees, so really, they were not just scavenging, but stealing. For years the story was retold, with my parents cast as poor but resourceful people trying to get ahead through the bounty of the land, and “that woman” playing the part of a rich heiress along the lines of those horrible people on the TV show Dallas. Though they wouldn’t admit it, the incident cured them of their gleaning tendencies. From then on, the walnuts for our holiday orevnitza came from the store. This entry was posted in DIY, Food and Drink, breads and pizzas, foraging, holidays and tagged Christmas bread, Christmas food traditions, Christmas recipes, Christmas traditions, foraging, Orevnitza, Potica, walnuts. Bookmark the permalink. Post a comment or leave a trackback: Trackback URL. How do I arrange for you to demonstrate Orevnitza for me? I think it may just make me leave babka behind. Dates, walnuts, sugar…mmmm. Next Christmas Susie! I only make it once a year. But I suppose we could arrange a special showing. Or, I could trade you orevnitza for babka! Thank you for sharing your story and your orevnitza recipe. 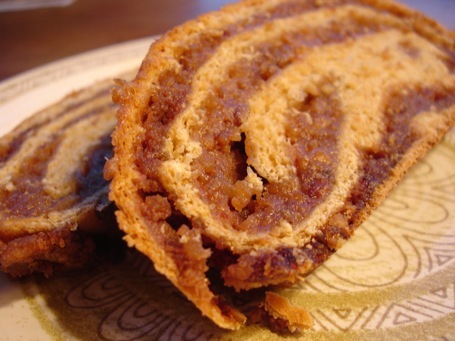 I will try your orevnitza maybe for Easter:) I like the idea of adding dates to the filling, sounds delicious!!! It is very similar to my mom’s kuglof recipe that she used to bake in a bundt pan. My dad has been asking me for kuglof in these last few months and I’ve been googling all over for a similar recipe to my mom’s and finally found one on food.com; if you search for kuglof you will find many different variations.